Curious about the legendary data recovery master and want to have a try? Leawo iOS Data Recovery provides specific iPhone data recovery guide, iPad data recovery guide, and iPod data recovery guide to solve any data loss problems that have happened to the iOS devices. 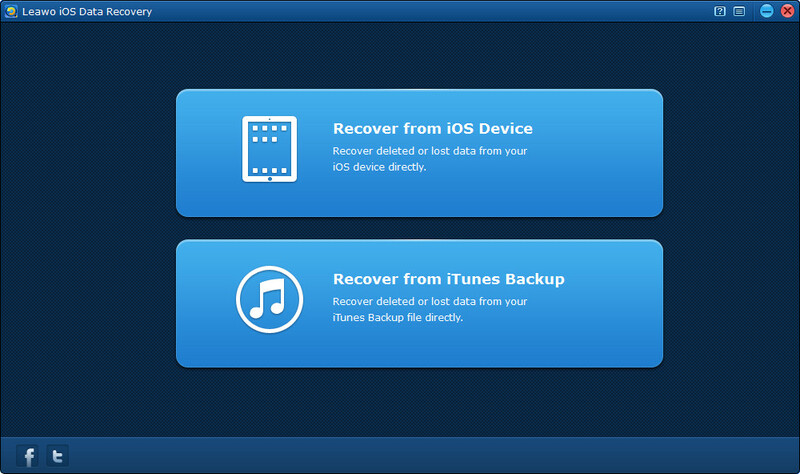 It offers quick solutions to recover multiple deleted, damaged, or lost data directly from iPhone, iPad and iPod touch. 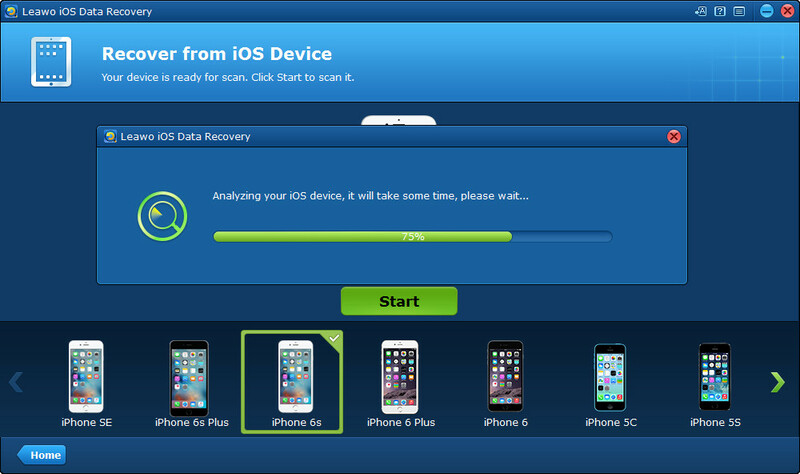 Besides data recovery, the tool can also quickly scan 12 types of data directly from the iOS devices or extract them from iTunes backup, and then export all of the data scanned to the computer as backup for further use. 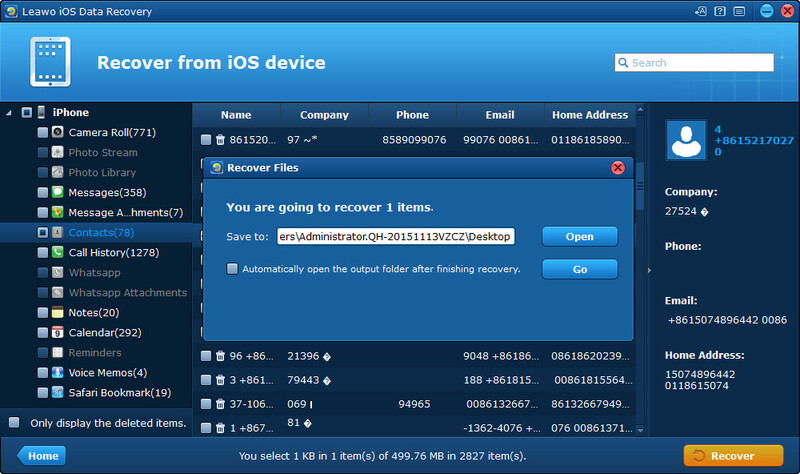 Follow Leawo iOS Data Recovery user guide below to learn how to recover data from iPad/iPod/iPhone right away. When you have downloaded and installed the software on your computer, run the program on your PC. Then you’ll see the Home interface with 2 recovery modes provided. Click the second option — “Recover from iTunes Backup” mode to begin the automatic scanning of the iTunes backups on your local PC. “Help”: Click “Help” button on the menu bar to be led to Leawo iOS Data Recovery User Guide page. 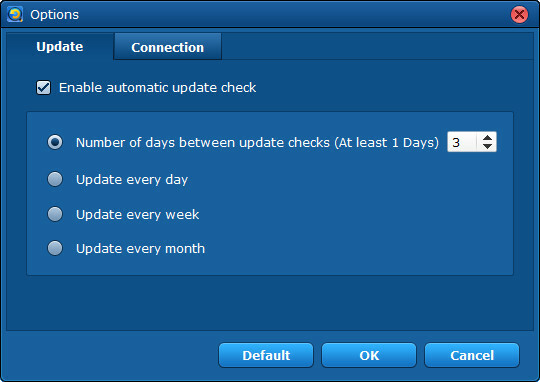 “Update” option: Allows you to set automatic update check period. The number of days between update checks is 3 by default. “Connection” option: By this option, you can choose to set a proxy or not. 2. 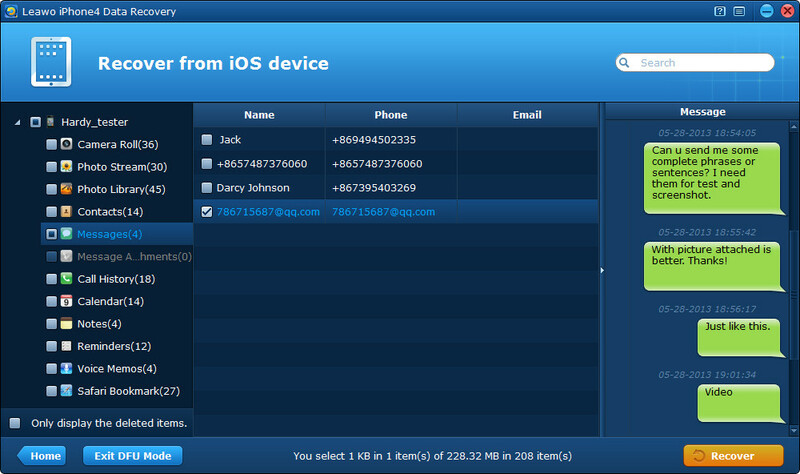 Click “Home” option, you’ll be led to Leawo iOS Data Recovery product main page. 3. Click “Register” , you can input the registration code you have received after paying so as to get the software bound with your local computer. You can also ignore this by clicking “Try” button on the bottom of the pop-up window. 4. Click “Buy” , you’ll be led to the product purchasing page. 5. Click “Check for update” , the program will beginning checking for new versions of the program automatically. 6. Click “Support” , you will go to the product support page with 4 helpful options: Lost Registration Code, FAQ Center, Tutorial Center and Contacts Support. 7. Click “About” , you can see the software version you are using, support page, home page and issuing incorporation name. 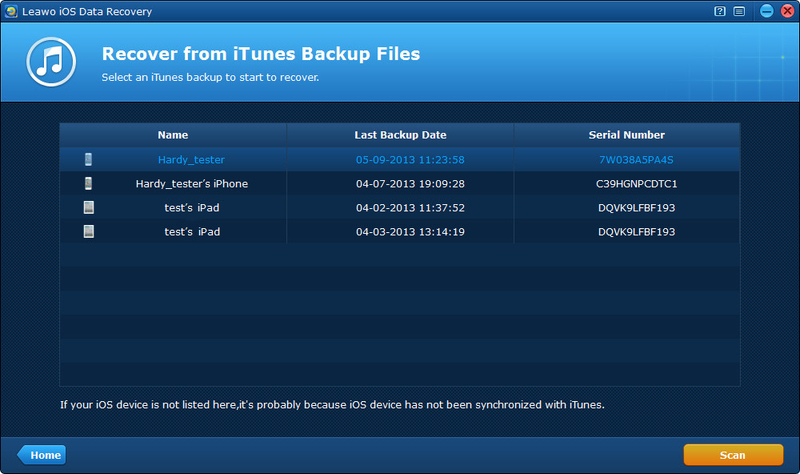 After choosing recovery mode, you can see a list with all the backups of different iOS devices on your local PC and the backups are categorized by Name, Last Backup Date and Serial Number. If your iOS device is not listed here, it’s probably because iOS device has not been synchronized with iTunes. “Scan”: Click “Scan” button, the program will start to scan the backup you have chosen automatically. In the scanning process, you can choose “Pause” or “Stop” if you have the needs. “Home”: Click “Home” button, the interface will return back to the Home interface where you can reselect the recovery mode. Only after a few seconds, all the 12 kinds of file types and the specific file number on your device backup will be listed on the left column, including: Camera Roll, Photo Stream, Photo Library, Contacts, Messages, Message Attachments, Call History, Calendar, Notes, Reminders, Voice Memos, Safari Bookmarks. 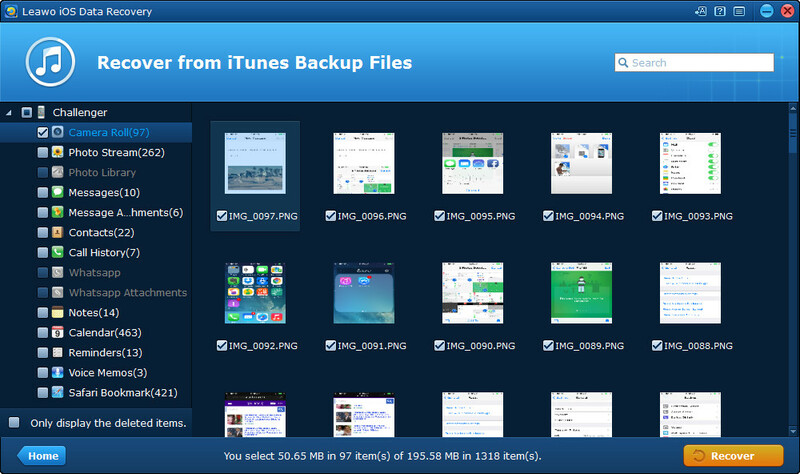 You can preview the files by selecting and ticking the file types on the left, or check all of the file categories for recovery by directly ticking your device name shown in the upper-left corner of the interface. As soon as the scanning ends, your device name, type, iOS version and serial number will be listed on the right of the program interface for your reference. Click “Home” button on the bottom-interface to return to Home interface for you to select the recovery mode again. Click “Recover” button on the right corner to pop up the Recover Files dialogue window. After clicking “Recover” button in the last step, you’ll see a pop-up “Recover Files” window. Click “Open” button besides “Save to”, the computer file explorer will be opened for you to pick out the specific files on your PC. Tick the option “Automatically open the output folder after finishing recovery” below saving location option, you will be led to the target saving folder you have chosen once you have finished recovery. Click “Go” on the right corner of the pop-up window, so as to start to recover data from iPad/iPhone/iPod immediately. 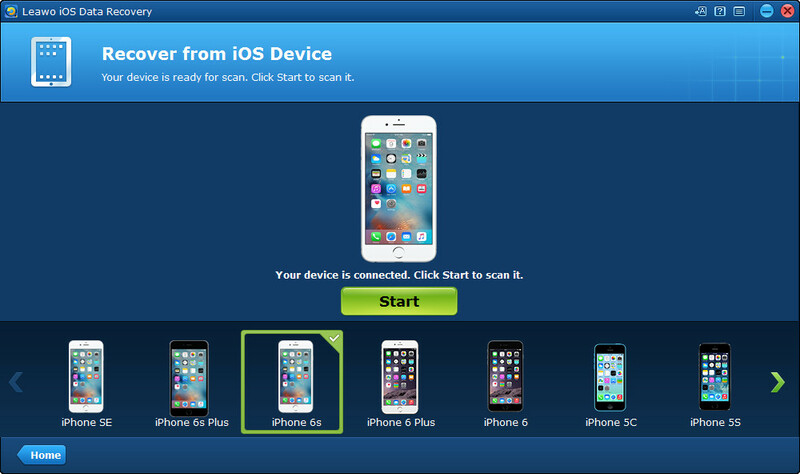 There are 2 situations to start the scanning of your iOS device. 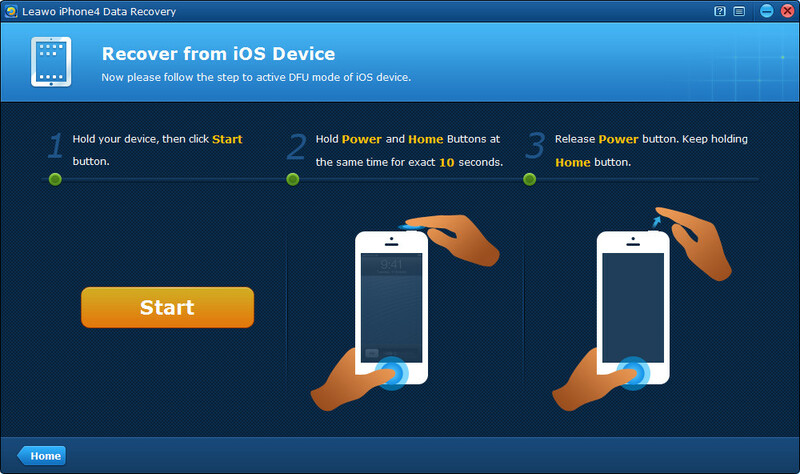 Situation 1: Launch the program first, and you’ll see the Home interface with 2 recovery modes available, click “Recover from iOS Device” mode, you’ll see the interface prompting you to connect your iOS device. Then just connect your iOS device with the computer. When your device has been detected by the program, you’ll see the “Start” interface shown in the second situation, click “Start” button to scan your device. If your device cannot be detected by the program, you can click “Device Cannot Be Detected” option on the bottom-right of the interface, which gives you tips to enter DFU mode manually and scan. 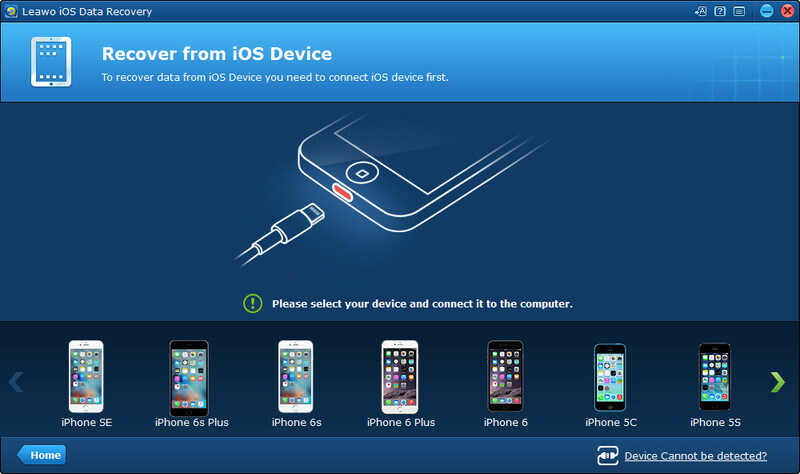 Situation 2: Connect your iOS device to the computer using a USB cable first, and then run the iOS data recovery program on your PC. Once your device has been recognized by the program, you’ll see a “Start” interface shown as below, just click it. After clicking the “Start” button in the center of the interface, the program will begin analyzing and scanning the device connected to the computer automatically. Remember not to pull out the device connected while the program is scanning. After scanning, you’ll be able to see all the 12 kinds of files that have been found in scanning your iOS device listed in organized categories on the left column. Click the file types and you can preview the files in thumbnails on the right of the program interface. The “Search” box on the upper right interface allows you to pick out your desired files quickly by inputting file names or file formats that you remember. “Only display the deleted items” option on the left corner makes you preview the data that have been deleted by you before. “Home” button can lead you back to Home interface to select recovery mode again. Click “Recover” button on the right corner of the program interface, then a “Recover Files” interface will pop up for you to specify a folder on your computer to save the files to be recovered and exported. You’d better tick “Automatically open the output folder after finishing recovery” option for convenience. After choosing saving location, click “Go” button on the right corner of the pop-up window to start to recover data from iPhone/iPad/iPod touch right away. This tutorial only applies to Leawo iPhone 4 Data Recovery and Leawo iPod touch 4 Data Recovery, so the devices to be connected should be iPhone 4 or iPod touch 4 respectively. Firstly, connect your iOS device to the computer and run the program on your PC. When your device has been detected by the program, you’ll see a “Start” interface with 3 simple steps for you to enter DFU recovery mode of your device. 1. Hold your device, then click “Start” button. After clicking “Start” button, the program will enter the second step automatically. 2. Hold “Power” and “Home” buttons at the same time for exact 10 seconds. You can watch the count-down timing on the interface in case of missing or exceeding the time span. When the first 10 seconds passes, the screen of the device will go black. 3. Release “Power” button. Keep holding “Home” button. When the device screen turns black or the timing passes, just release “Power” button slightly, but keep holding “Home” button for another 10 seconds until the message “You have successfully entered DFU mode, now you can release the Home button” prompts. Once the DFU mode of your iOS device has been activated, the program will automatically start to analyze and scan your device. “Pause”: Allow you to pause the scanning for a short time period. “Stop”: Stop the scanning of the iOS device. 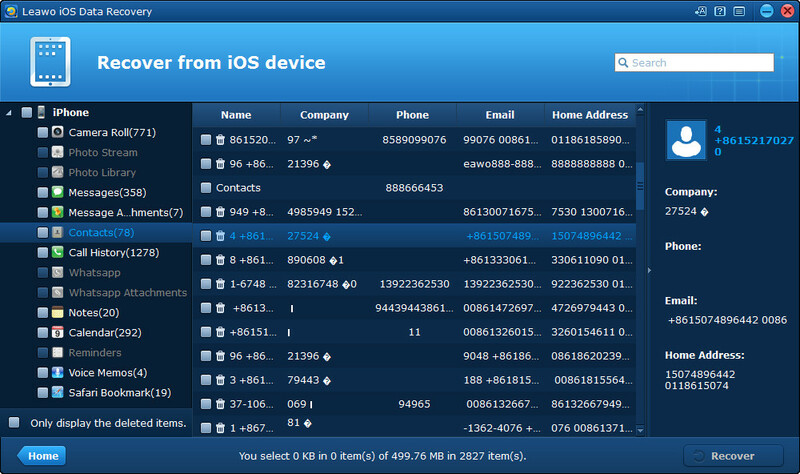 After a few minutes scanning process, all the data on your iOS device will be present before you in various categories. You can select the file types on the left column and click them to preview in intuitive thumbnails. By clicking the given parameters for different file types, you are sure to filter and pick out the files you desire for quickly. “Only display the deleted items”: Make you only preview the files that have been deleted from your device. The deleted files will be marked with dustbin icons beside their file names. The deleted data scanned under DFU mode contain taken photos, recorded videos, contacts, messages (MMS, SMS, iMessages), notes, call history, calendars and reminders. The “Search” box allows you to quickly find out the files you want to get by inputting file names or formats. “Home”: Allow you to return to Home interface to change to another recovery mode to scan if your desired files are not contained in the scanning results. “Exit DFU mode”: Allow you to quit the DFU mode and return to Home interface. 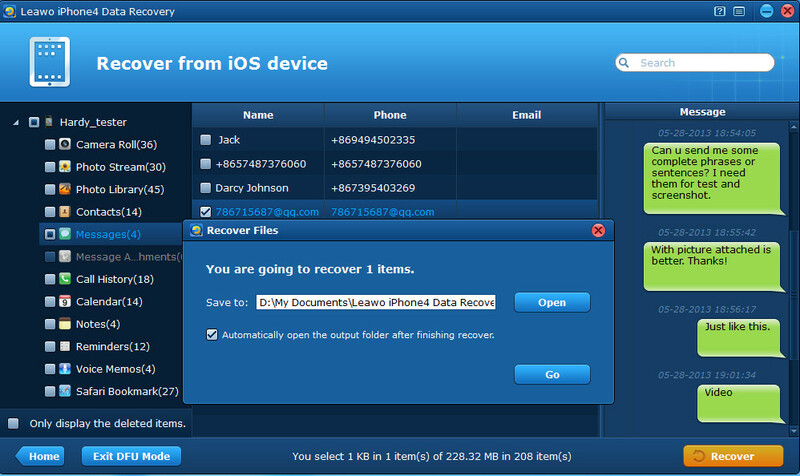 After preview, tick the files you want and click “Recover” to start to recover deleted data from iPod/iPad/iPhone. Then on the pop-up window, choose the specific saving location on your PC by clicking “Open”, and tick “Automatically open the output folder after finishing recovery” checkbox if you need. 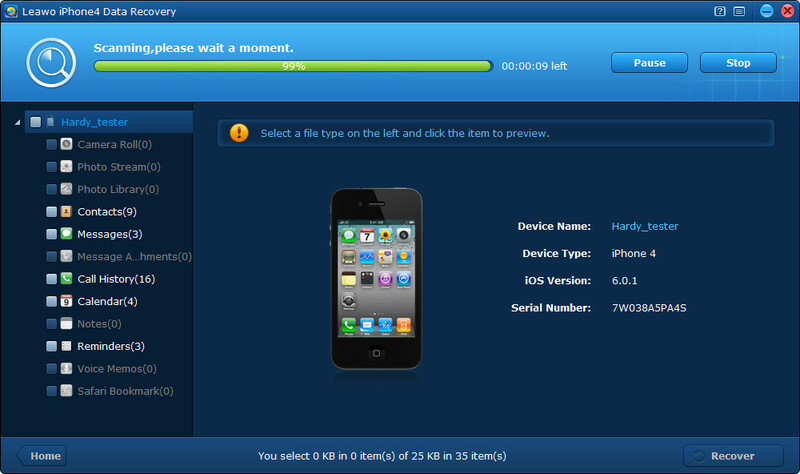 Finally, just click “Go” to start to recover data from iPod/iPhone/iPad.